Once a year Minnieland hosts a fun day for all the parents and children to come and enjoy. We arrange activities for both big and small to enjoy. This year our theme was food around the world where each class had to decorate and prepare foods known to their country for everyone to enjoy. 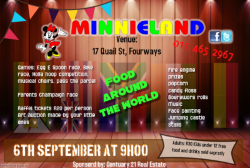 Where can you go where you are able to find food types ranging from South Africa, India, Belgium, Zimbabwe, Hawaii and more… Be sure to keep an eye out for our next Fun Day.